We are happy to answer all questions! Tropical settings, beautiful sunset views, do as much as you want to do. Just lay by the pool and catch a sun tan, or enjoy the diving, sailing, swimming, shopping, and good restaurants. Perfect location... easy drive north to South Beach, or south to Key West! Bathrooms have recently been remodeled! Kitchen has recently been remodeled! TVs are in living room and both bedrooms. Complex has, shuffle board, ping pong, basketball and tennis. We do have a boat slip and can suggest places that will deliver boats or jet skis, etc. to our private slip. Gorgeous large pool with two sundecks, one overlooking the bay, spectacular sunsets every night! 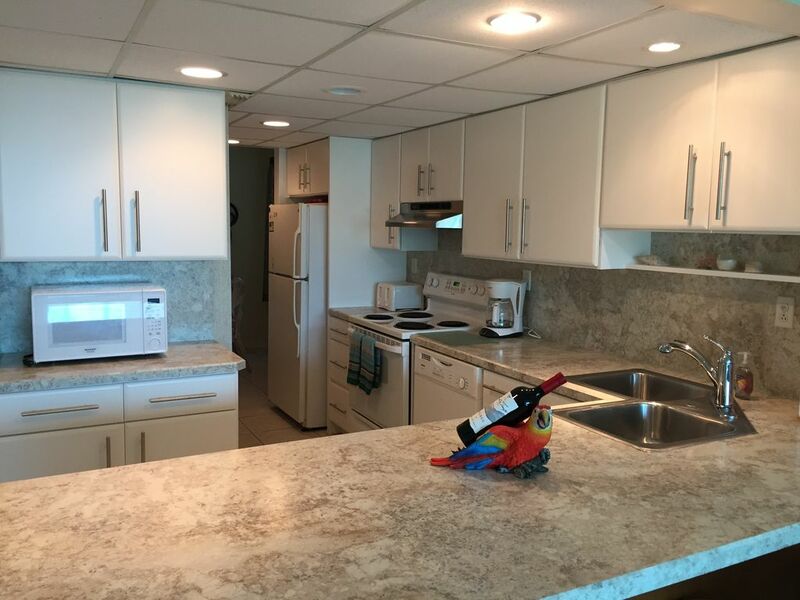 3 Cable TVs, Hi Speed Internet, WiFi, Heated pool, Queen Sofabed in living room, Private boat slip, Covered parking next to elevator Beautiful Water views from within, recently remodeled bathrooms and kitchen. Private boat slip at no additional cost up to 30' boat. Great place, great area, great people to work with. Everything you need is right there. Will stay there again when back in Florida. Thanks again for making our stay wonderful. The condo was very nice. It is in a great location right in the heart of key largo. The place is very clean and decorated very nicely and has full amenities. Very nice balcony and views. Jane was very prompt in answering any questions or concerns. We will definitely visit again. Glad you enjoyed your visit Tiffany, can't wait to have you stay again! We especially love our "repeaters"
Stayed here with my dad and a couple friends. We brought the boat down and docked it in the included slip. We had a great time getting out on the water and snorkeling every day. The condo was exactly as described. Jane was great to work with and was quick to answer any questions I had. If you are trying to decide between two similar places, stay in this one. Thank you so much for the wonderful review, we appreciate that you chose our condo and hope to hear from you again very soon! Great place and location. Jane is very easy to work with and accommodating. We towed our boat down and took advantage of the slip. The condo is in a great location for anyone going out to the reef. The condo was very nice. The owner, Jane, was accommodating and easy to work with. Will definitely stay here again. I thank you very much for the wonderful review, we strive to make your stay as pleasant as we possibly can. Hope that you can return soon, you were lovely guests! Awesome week in Key Largo!!! The condo and boat slip was great. It had an awesome screened balcony with an incredible view of the bay. We ate breakfast and dinner out there almost every day. Only had one issue.... the TV went out, but Jane was quick to have it replaced. Thank you!! I have never rented from someone who made it so easy and they were quick to answer any questions. We will be back!! Thank you again for choosing our place, I look forward to you returning! I love Moonbay Condos in Key Largo! I had a wonderful stay at Moonbay Condominiums in early June. The 4th floor condo is spacious, well furnished, and very clean – with a light, airy, nautical feeling and an amazing view of the bay. I enjoyed my time in the unit very much. I even did some light cooking. I also enjoyed spending time on the complex grounds. The basketball and tennis courts are top-notch, and the pool area and sundeck are amazing. My favorite spot is the thatched Tiki hut on the bay, alongside the boat slips. The view is beautiful, especially at sunset. Beyond the condo complex, I don’t know where to begin. I had a great week in the Keys, full of sunshine, outdoor activity, and outstanding food and drink. Thanks for the hospitality, Jane. I’ll definitely be looking to visit again soon.